This entry was posted in Monetizing content and tagged Groupon by Phil. Bookmark the permalink. And that’s fine..because that’s not who they want. They want to go after small local businesses. Anecdotally, in chicago they have had several wonderful restaurants (yes…beard award winners) which i’ve went to. I’ve talked with mgmt at a couple of the restaurants that i frequent and they were very happy with the results. Spring (for example) has since followed up with the people who used their groupons giving them other coupons (with limited availability). I would agree that usually restaurants won’t recoup that original rush; however, it gets them exposure and potential for return customers. Sure. And some of them are exclusive. Do you have a distribution showing one versus the other? I’ve seen quite a few on groupon that i’ve not seen anywhere else (such as some dental / teeth whitening…flight lessons…sky diving…etc) at least for the price offered. Sorry..coupons are a trend? Saving money is a trend? No. Let’s think of our grandparents’ generation for a moment. The depression shaped their worldview. My grandmother has 2 dozen bottles of palmolive in her basement because they were on sale. This recent economic downturn has the chance to shape our psyche…turning us from a consume consume consume nation into one that isn’t averse to being frugal here and there. All the above being said, I think groupon is overvalued as well (probably not as much as you do); however, i think most of your points are poor. Groupon appeals to startups and businesses that are on the edge of failure. There is no way successful businesses are going to degrade its brand by participating in a fire sale of its products and services. This will limit the number of type of businesses the site can tap into.nnAt the end of the day the scaleability of this business model is limited. nnNo way it is a billion+ dollar company. I think it depends on whether the new investors got a liquidation pref or not. If so (and likely) then their bet is the entire company is worth more than their investment – $135M – on an exit or in secondary sales. Not bad when your investment creates a deemed value of 10x higher than that. I appreciate the point by point argument. “Exposure” and “Potential for repeat business” are fluff benefits. I’m surprised Groupon’s marketing materials for businesses don’t show quantified returns to repeat advertisers….even just in terms of foot traffic. I’m arguing that they don’t have a strong advantage in sourcing unique deals. That’s why they have so many copycats, and why other email lists can easily copy this. It’s interesting to think that a generation’s behavior might be shaped by this latest recession. Perhaps it has in some of the hardest hit regions, like Las Vegas or Detroit. I’ve just updated the post to note that insiders sold $130 million. That is a lot! That’s honestly a great point. I think Groupon’s email list is worth hundreds of millions (i’m thinking dailycandy thrillist shopittome; or their current cash flow). So as an investor with a liquidation preference, you would have downside protection. The deal is definitely overvalued, but I think they are very close to a billion dollars. The overvaluation is by about 25%-30%. I did a valuation on them, that you can check here: http://bit.ly/9DHGk5. Would love to hear your comments on it. The worrying thing with that valuation for me, is the ease that copy cat sites can operate and set up. I would suggest it maybe a fad, but tbh people love their money off vouchers. Phil – I agree the product they provide can easily be copied and improved. They are overvalued because like people have been saying their is no unique technology that sets them apart from the rest. I feel the product and model could both be improved upon and right now that makes the playing field equal. Also in my eyes they don’t offer anything to create loyal customers, which will make it easy to lose customers. This also assumes Groupon is standing still with their current product portfolio. With the kind of revenues they are generating and the amount of financing they are raising they can make some pretty major inroads in to other ideas. As someone else said, the data alone they have on buyers is pretty damn valuable. Forget knowing if someone clicked on an ad or link or what they’ve “liked” by clicking a Facebook like icon, Groupon knows that you’ve been willing to buy something in a particular category, how much you’ve spent, if you’ve been a repeat buyer, etc. Pair that information with some advertising opportunities global expansion against lesser funded competitors and you’ve got a pretty lucrative business model. Facebook, Twitter and Google all have technologies that can be easily duplicated. I was speaking to a colleague about this about a month ago after we analyzed this entire business model. The conclusions we came to are very similar and hinged on them and one important fact that you didn’t mention. The margins they are taking from the businesses make this something that a lot of businesses do not want to do again. We’ve already seen the complaints and heard first hand from business owners we know, and their lack of success actually making money. Sure, business in the door is good, but not thousands of customers that you don’t make any money on, hoping they’ll come back again. So the strategy is ‘lose money’ hoping you spread your word. That’s expensive advertising in my book, and the greed factor of Groupon is entirely unsustainable. In fact, the prediction we concluded on in our discussions was that this type of service could easily be added to additional and successful models that can charge a lot less % or offer it as a free service. The technology is basic, so what’s to keep any major portal player from offering this in the future as a value add. The bottom line is that there’s no way possible these margins they are robbing from businesses can last. This is a short run greedy attempt to make money around fluff buzz, the investors and founders probably already know that, would have to if they were worth their salt, and they have nothing else, no business directory, no reviews, no nothing. Just highly unprofitable deals for the business… and only profitable for Groupon, because they are taking all the profit from the business. Horrible business model imo and it’s laughable to watch all these deal sites and options for deals on existing sites pop up everywhere with the exact same strategy. There are even middlemen deal scripts popping up who want to try and split the profit even further, as if this is some great and complicated technology. Complete lack of vision or foresight. And Matt’s comments miss the major point of important analysis entirely. Phil is absolutely correct in that exposure and repeat business are fluff benefits. That’s laughable. I’ll say it to close one more time for clarity, and just for Matt – “Groupon makes money, their businesses break even”… and as one business who did a Groupon told us, “I don’t want to service non-profitable business, especially hundreds or thousands of them for months… that could literally ruin my business”. 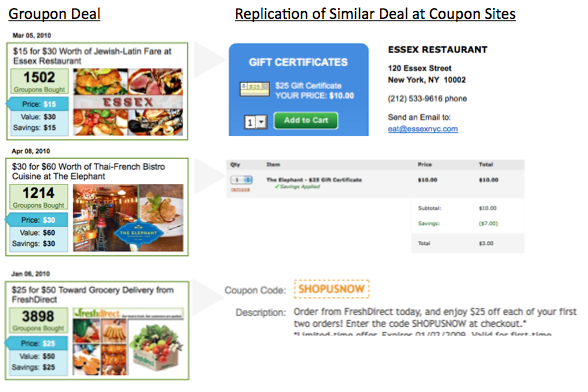 Great point about how Groupon created an ad unit that makes it cost effective to sell. On many of these local advertising deals they’re netting thousands of dollars (assuming net revenue equals 25-50% of an average deal selling 500 vouchers at an average price of $20/voucher)–that can definitely support an outbound sales team. Though this ad unit is profitable to sell, I think it remains to be seen whether the ad unit is delivering ROI for most categories of local businesses. Evidence suggests it’s getting customers in the door at a loss or breakeven, but not delivering long terms returns. Seems only to make sense for local businesses that can use a cheap/unique trial offer and hope to upsell to memberships. Doesn’t feel like a multi billion dollar opportunity if it only works in this narrow segment. There’s an anti-Groupon Facebook group called Groupoff. Hopefully a place for everyone to discuss pros/cons of Groupons. I think one must look at Groupon under a customer acquisition cost. If you dont have the cashflow to support that acquisition cost then you are doing this for a short term revenue boost. Another note. I’ve spoken with a handful (10-12) merchants who have used Groupon. A common note is struck with most of them regarding their experience with Groupon: They Feel Fleeced. e.g. – they give away the farm to get “new customers” into the door, but the customers never come back. It’s almost like these are Groupon Groupies and the merchant got their five minutes of fame – at a high cost. The Groupies are on to the next deal, Groupon got the merchant’s emails, and the merchant is left holding the bag.